japanese architecture practice takao shiotsuka atelier has sent us images of ‘8building’, a converted mixed-use building in the urban center of oita-city, japan. situated on a slim site surrounded by adjacent buildings on three sides, the design seeks to create well-lit, open spaces that exhibit flexibility despite its small footprint. 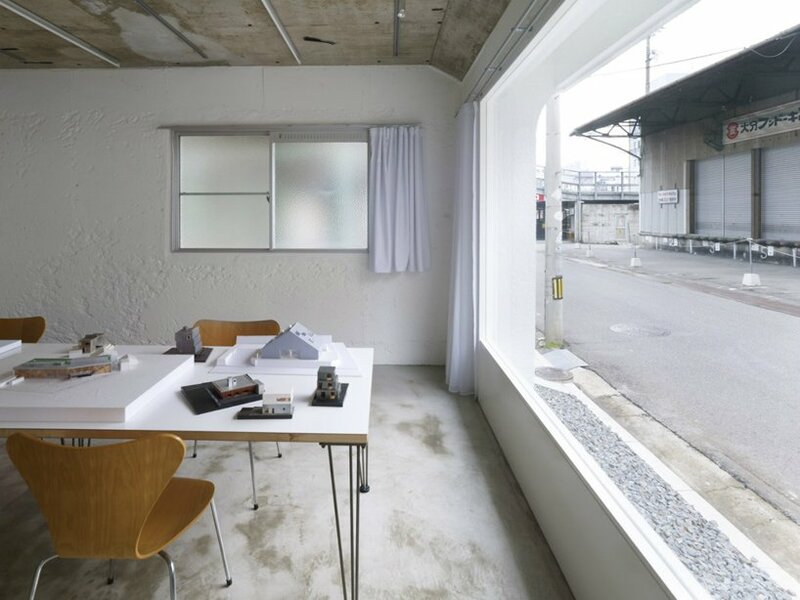 originally a small-scale studio apartment, the thirty year old building has been stripped of its eaves and veranda to secure large amounts of sunlight for the interior units. windows facing onto adjacent buildings are frosted to maintain privacy while still maintaining daylight intake. singularly finished in white, the three-storey structure is quiet and unassuming with a large aperture window on the ground level. a small gallery space within is put on view, engaging in direct dialogue with the street and the neighbourhood. gutted of its internal partitions, the layout has been rearranged to accommodate a gallery and office on the ground floor, two live/work units on the level above, and a penthouse apartment. the organization of programs are simple and pragmatic with a linear circulation route. much like the exterior, the interior is finished in white to keep each space neutral and flexible. industrial details of the former building has been preserved to reveal the previous identity of the project. I agree so interesting especially the views of the hallways – wow! It\’s not creepy, its frustrating …..that I cannot see any possible reason for such a mundane building to be published in Designboom. I dig this strippd down look. The inside looks much bigger than what the street elevation lets on. frosted glass, aluminium windows, exposed wiring ducts, basic hardware shop sink unit, washing machine dumped in the corner? … I agree with wwwillem … why is this on designboom? I used to squat in derelict factories that looked exactly like this – they were a much cheaper way of doing it. It has a kind of ‘gulag’ aesthetic… it must really discourage creativity – it has a sense of a loss of all hope and aspiration – nothing to live for… just despair. I THINK THE ONLY REMARCABLE THINGS IN THIS BUILDING ARE THE BATHTUB SOPORTING SISTEM, PRETTY COOL, AND THE JACOBSEN CHAIRS……TAKE THAT OUT AND WHAT DO YOU HAVE? MAYBE IT WAS THEIR INTENTION….. THOUGH THE FLOORPLANS ARE GREAT!